When the Illinois General Assembly overrode Governor Rauner’s veto of the FY2018 budget package in July, it estimated that the enacted budget would have an operating surplus of about $360 million. Since the override, Governor Rauner has insisted that the legislature’s budget plan results in a deficit rather than a surplus. This week the Governor’s Office of Management and Budget (GOMB) released numbers supporting that assessment in an economic and fiscal policy report and accompanying five-year budget projection. Similar numbers were presented in offering documents for the first round of bond issuances to pay down part of the State’s multibillion dollar backlog of bills. GOMB projects an FY2018 operating deficit of $1.5 billion, based mainly on lower revenues and higher debt service and pension expenses. The following table compares the General Assembly’s budget estimates with the numbers provided by GOMB. The General Assembly numbers were published in a recent report by the legislature’s Commission on Government Forecasting and Accountability (COGFA). GOMB projects revenues of $35.9 billion in FY2018, about $511 million less than what was projected by the General Assembly. The legislature’s revenue estimates were developed before final results were available for the previous fiscal year. As explained by Fitch Ratings, weaker than expected revenues in FY2017 left the State with a lower revenue base in FY2018. In February 2017, when the Governor issued his proposed FY2018 budget, Illinois’ major State revenue sources—individual income taxes, corporate income taxes and sales taxes—were expected to bring in $23.6 billion in FY2017. They actually generated $23.0 billion, according to the bond documents. GOMB, like the General Assembly, includes $300 million of revenues ($240 million net of associated expenses) from the planned sale of the James R. Thompson Center in Chicago. However, as the Civic Federation has noted, these revenues may not materialize if the transaction cannot be implemented at that sale price or by the end of FY2018. On the expenditure side, one of the largest differences is in expected pension contributions. GOMB’s estimate of the State’s FY2018 General Funds pension contributions is approximately $7.0 billion. That figure is $428 million higher than the General Assembly’s estimate of $6.6 billion. The difference stems mainly from delayed implementation of a new Tier 3 pension plan for new university employees and public school teachers outside Chicago. The plan, which was part of Governor Bruce Rauner’s proposed FY2018 budget, was intended to save the State about $500 million but will not be launched in the current fiscal year. Illinois’ largest pension fund, the Teachers’ Retirement System, has said the earliest implementation date for Tier 3 would be July 1, 2019, which would affect the FY2020 budget. The General Assembly’s budget allowed the pension systems to set their own starting dates. Despite the Tier 3 delay, another pension provision in the FY2018 budget that was also included in the Governor’s recommended budget is expected to result in significant savings. Changes in required contributions related to revised actuarial assumptions are now phased in over five years. The smoothing technique applies retroactively to any assumptions made from 2012 on. As discussed here and here, smoothing generates savings by deferring contributions to the future. In addition, local employers, instead of the State, are now responsible for current pension benefit costs for university employees and teachers outside Chicago with salaries above the Governor’s. Without the changes, FY2018 pension fund contributions would have been more than $7.8 billion. GOMB projects that debt service transfers from General Funds will be $581 million more than originally projected. This is due to the fact that the General Assembly planned to allocate its expected $360 million surplus to pay debt service on $3 billion of borrowing to reduce the bill backlog. Now that GOMB is moving forward with the borrowing, it has added expected debt service to its expenditure projection and has nearly doubled the estimated amount because it plans to issue the full $6 billion authorized by the budget. GOMB’s figure for statutory transfers is $234 million higher than the legislature’s at $573 million. The increase is related to the fact that the FY2018 budget bypasses General Funds in the distribution of funds to local governments and transit districts. As discussed here, the money now goes directly to other designated accounts outside of General Funds instead of being deposited into General Funds and then transferred out. However, $234 million of scheduled transfers were made from General Funds after the beginning of the fiscal year on July 1 and before the budget was enacted on July 6. For preschool through secondary education, GOMB’s estimate of $8.0 billion is $221 million below the General Assembly’s $8.2 billion. The amount represents a payment to the Chicago Public Schools for normal pension costs and retiree health insurance expenses. GOMB included the payment in the Government Services category instead of the education category. GOMB also showed savings of $156 million, labelled “deficit spending reductions.” These initiatives of the Governor included limiting increases in State spending, taking 5% reductions in many programs that were not reduced by the General Assembly and continuing to require six-month eligibility determinations for participation in the State’s subsidized child care program for low income working families, according to the economic and fiscal policy report. 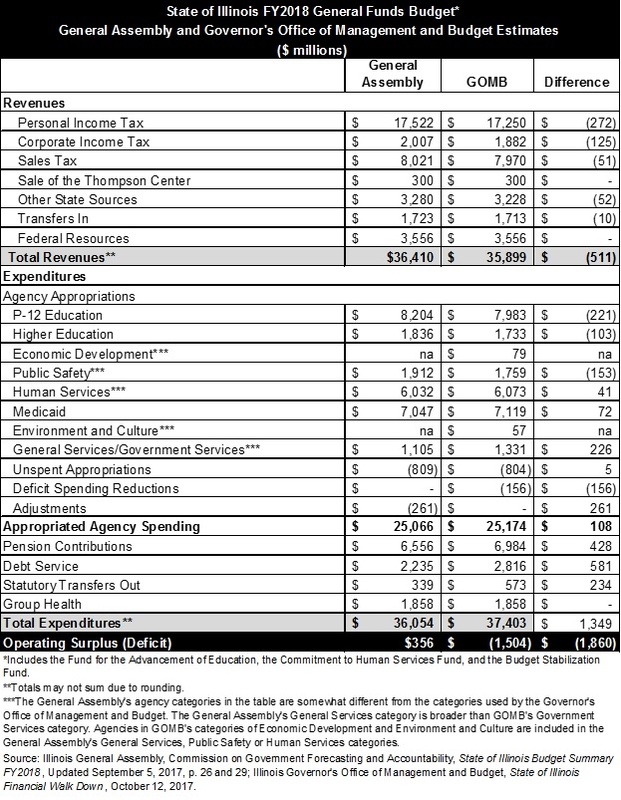 Finally, GOMB estimated total expenditures at $37.4 billion, which is $1.3 billion higher than the General Assembly. The total of all these differences is a net $1.8 billion less for the State, resulting in GOMB’s estimate of a $1.5 billion deficit rather than the General Assembly’s expected $360 million surplus. The Governor’s Office plans to use the proceeds of approximately $6 billion from selling bonds to help reduce the bill backlog to about $7.5 billion by the end of FY2018 from $15.1 billion at the end of September 2017. According to the economic and fiscal policy report, about $3 billion of the bond proceeds will be used to pay group health insurance bills and the remaining $3 billion will be used to pay Medicaid bills and other overdue bills that accrue interest penalties at rates of as much as 12% per year. Use of the bond proceeds to pay Medicaid bills is expected to generate federal reimbursements of $1.1 billion. In addition, the State is expected to transfer or borrow a total of $850 million from other State funds to help reduce the backlog. The General Assembly’s budget implementation measure authorized $293 million in fund transfers and $1.2 billion in interfund borrowing to be paid back within two years. According to GOMB, there were approximately $1.2 billion of operational expenses incurred by the State in FY2017 that have yet to be appropriated for. Although the General Assembly authorized the use of FY2018 appropriations to pay FY2017 bills, this would result in an appropriations shortfall of the same amount for FY2018 bills. However, the $1.2 billion is already included in the total bill backlog. GOMB’s five-year budget projection shows the bill backlog growing from $7.5 billion at the end of FY2018 to $9.1 billion in FY2019 and $13.7 billion in FY2023. Expenditures are expected to outpace revenues despite significant revenue increases in FY2018, including an increase in individual income tax rates from 3.75% to 4.95% and corporate tax rates from 5.25% to 7.0%. However, the additional revenue—approximately $5.2 billion in FY2018, according to COGFA—has improved the State’s financial outlook. GOMB’s previous five-year forecast, in November 2016, projected a backlog of $47.1 billion at the end of FY2022.